Poinsettias are a hallmark plant of the holidays. But why are poinsettias so symbolic to Christmas? The Poinsettia plant was originally native to central America and found its way into the USA around the mid 1820s. In fact, these plants were named after the first US ambassador to Mexico, Joel Roberts Poinsett. 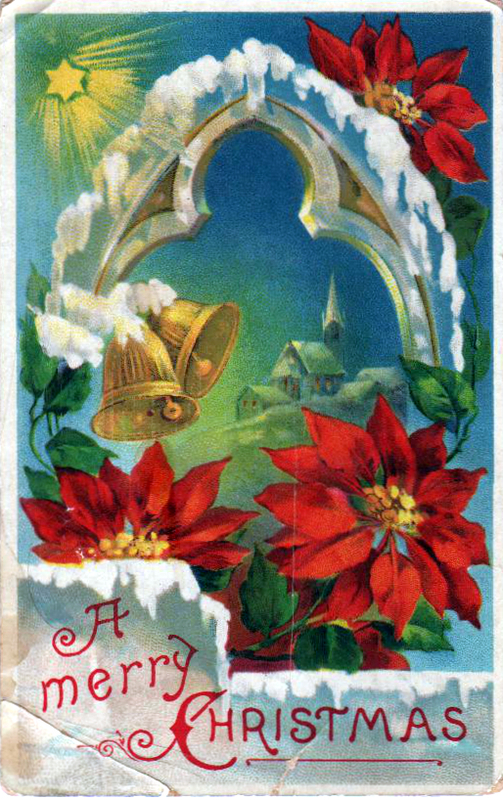 As poinsettias became more popular throughout the nation, so did its association with the holiday season. This connection can be traced back to the flower’s original Mexican origins. According to Christmas lore, a young girl named Pepita didn’t have a gift to present to baby Jesus on Christmas Day. Instead, she presented a small bouquet of weeds which suddenly bloomed into the bright red flowers, known to us as poinsettias. The petals of the poinsettia flower also symbolized the Star of Bethlehem, the guiding star which led the wise men to baby Jesus. Need more free plants and flower images for your crafts? Check out the complete nature image gallery or head straight to the Christmas image Library four more free Christmas illustration for your projects. Don’t forget to like and follow on Facebook for exclusive vintage illustration you can’t find on the site!